Cater and Sadie are back for one last fight in The Serpent’s Shadow, the last installment in The Kane Chronicles. The Kane Chronicles are translated from recordings that the Kane siblings sent to Rick Riordan. Every few of the chapter’s change prospective, from Cater to Sadie, with hilarious brother/sister bantering. Battling to return Ma’at – order – and destroy Chaos, Cater and Sadie are joined by their friends, to save the world. 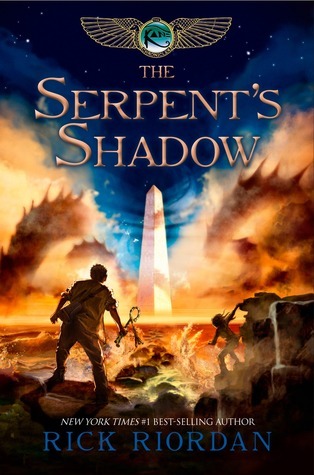 In the Serpent’s Shadow we see more of the gods we already love with a few new editions (including a not so friendly ghost). We also see lots of action, a little less humor, but a bit more romance in this installment. Riordan sums up the trilogy perfectly. I was not disappointed. I’m happy to say that the concluding chapter gives us fans hope that we will see our favorite characters reappear in Heroes of Olympus series. If there are any fans out there who loved the world of Percy Jackson and the Greek gods, and are thinking about reading The Kane Chronicles, make sure you do (if only for the cross over references later). 4 Stars: I really liked it. I recommend it. I have this, haven’t read it yet, but I’m excited to, I really liked the Percy Jackson series! You will have to let me know what you think when you read them 🙂 Have you read the Heroes of Olympus series? Yes, I really liked them! I finished the whole series pretty quick so I picked up a couple other Rick Riordan books, but I haven’t gotten to them yet. I’m excited to though! I’m in the same boat!